At Sydenhams, we stock a range of cavity closers & trays, whatever you need for your project, we've got you covered. We stock a range of Cavity Closers, supplied by Dacaite. Heat loss and cold penetration - Closers are used to overcome thermal loss that occurs around unprotected cavities and reveals. Thermal loss can result in problems of condensation, staining and mould growth at the reveals of these openings. The use of our Dacatie cavity closers. Prevent moisture penetration- The use of a cavity closer will prevent the ingress of water around a window or door. Create a fire barrier - Where a fire barrier is required, a Dacatie fire rated cavity closer should be used. Please find information below, regarding all the cavity closers we stock. If you want more information, or to purchase, please find your local branch. A versatile and economic PVCu insulated closer for cavity widths between 50 and 100mm. 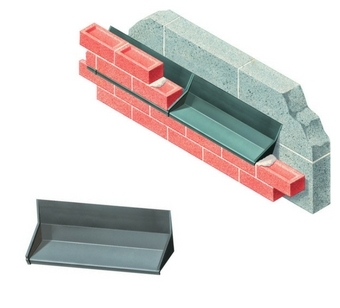 A versatile insulated cavity closer that is easy to use to achieve building regulations where cavity widths are 100-150mm. Can be used for first or second fix. 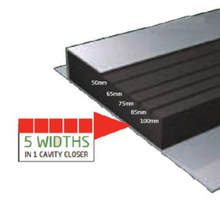 Overcomes cavity width variations with one profile to cover 4 cavity widths. 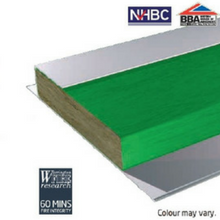 Supafix Fire Rated is a PVCu cavity closer with mineral wood insulation offering 60 minute fire intergrity. It can be used in conjunction with any window or door material or system. It is suitable for second fix applications & timber frame construction. Dacaproof is designed specifically to be installed in window and door reveals when brickwork is constructed, to stop water penetration. 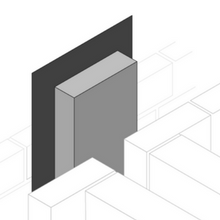 We offer a range of cavity trays that are flexible to your requirements. 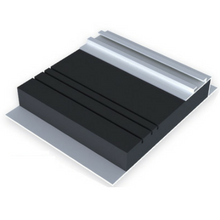 All offer a long lasting solution to preventing dampness from penetrating below the roofline.